FIFA 15 hits our shelves tomorrow and, based on some reviews, it’s the best edition of the legendary football franchise yet. New features include better graphics (obviously), improved keepers (which should hopefully help them deal with simple backpasses) and something called emotional intelligence, which seems to make your players more like the real life prima donnas we all know and love. The only thing worse than diving in football is sinking your teeth into one of your opponents (which is why everyone loves Luis Suarez). It certainly shouldn’t be encouraged by a video game. We love that FIFA is all serious now, but diving would definitely make things more fun. Plus: imagine how fun/annoying it’d be if you/your best mate won a game by cheating! Jose Mourinho is best known as the manager of Chelsea, but his real purpose in football is to wind up as many people as he can. We think this would make for an excellent new game mode in which you play as Mourinho and travel through the game’s stadiums calling people names and questioning their talent while trying to not get punched. Opponents would range from the meek (children at football games) to the terrifying (Alex Ferguson mid-hairdryer treatment). We’d like to be able to control every aspect of our player’s life, from avoiding the paparazzi after a heavy night out to holding an impromptu fireworks display in the bathroom of our ridiculously-sized mansion. FIFA has let us control entire teams, individual players and even goalkeepers in the past. But what about that poor man in the middle, the referee? Be A Referee mode would take you through the dizzying highs (sending off Cristiano Ronaldo in the World Cup Final) and the crushing lows (being called rude names by fans and the tabloids) of referreeing. You’d be given complete freedom to referee how you see fit, so you could send everyone off if you wanted. At the end of your career, you win…well, nothing. Referee’s don’t get prizes for their hard work. They’re the heroes we don’t recognise, but the heroes we’d be unable to live without – a bit like Batman if he beat baddies with coloured cards instead of his fists. This is a bit of a controversial choice, because Ultimate Team’s chemistry feature forces players to get creative when creating their squads. But we’d really, really like to put together a team with the world’s best players without being hampered by poor chemistry. Please make it so, EA Sports, even if it’s just for a day. 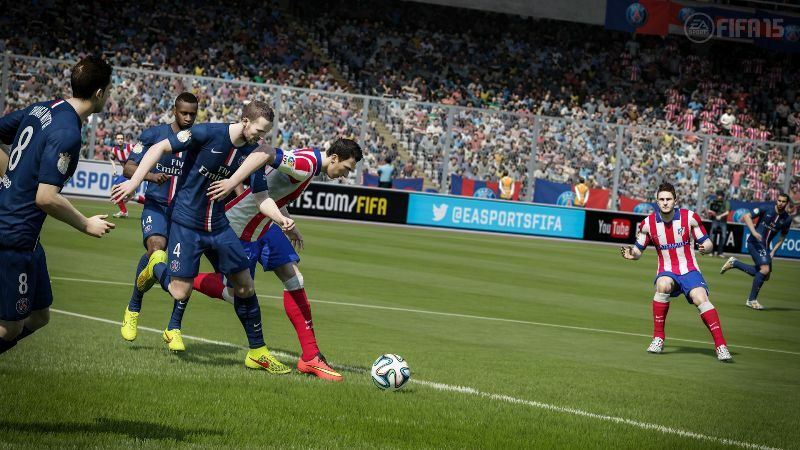 What features would you like to see in FIFA 15? Let us know in the comments. And don’t forget, you could WIN an Xbox One if you trade in selected games before September 30th. Click the banner below for more details.